The heart of winter has arrived and as usual temperatures across the Northeast and Midwest have plummeted. Just a few weeks ago, wind chills in the greater Pittsburgh went below zero degrees F. It can be excruciating to stay outside for more than five minutes when temperatures dip that low, but many of us at the University of Pittsburgh have to brave the weather in order to make it to work due to a lack of parking spots in Oakland. Of course, this is nothing new. What is new, relatively speaking, is the technology that makes our morning commute in the harshness of winter more tolerable. Unfortunately, technology loses functionality when temperatures drop below freezing. 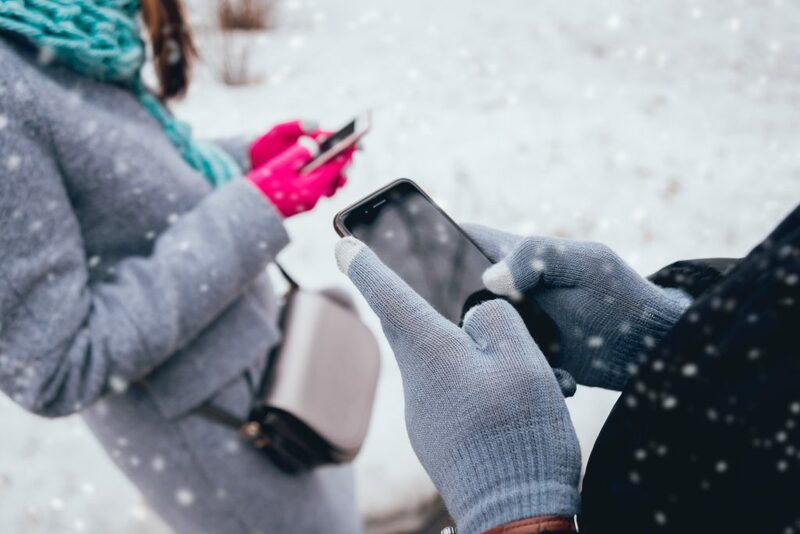 This article’s intention is to inform you of what to expect from the various components of your devices and how to better manage them in the extreme cold. After all, there isn’t anything that makes a commute to or from work much worse than having your devices fail while waiting for public transportation. Batteries are by far and away the most likely part of your device to fail in the cold. This is problematic because almost every device we use is powered by lithium-ion batteries. Lithium-ion batteries are the industry standard for personal electronics because they have high energy density and have the ability to handle both low and high currents. These are good properties to have in a battery. However, those same properties run into problems when temperatures dip below 32 degrees F. The reason is because lithium-ion batteries have very little internal resistance. Less resistance means these batteries generate less waste energy heat. In general, this is a positive attribute to have in a battery. However, the absence of waste energy heat means the battery is more vulnerable to cold temperatures. In other words, the colder it becomes, the chemical reaction that occurs inside the battery gets slower. This means the battery drains faster. Smartphones, in particular, are vulnerable to this problem because they are designed to sit mostly inactive for long periods of time throughout the day. What this means is that their batteries do not draw enough current to heat themselves. The performance of individual products will vary based on the manufacturer, battery model, and wear and tear on the device. According to Apple, you should use iOS devices where the ambient temperature is between 32 and 95 degrees F. The Amazon Kindle Oasis user guide states the same temperature range for its operating temperature. The FitBit Charge 3 manual lists an operating temperature range of 14 to 113 degrees F. Samsung’s Galaxy S9/S9+ user guide does not give an operating temperature range. While batteries are the main component most likely to have issues in cold weather, LCD (liquid crystal display) screens also run into problems. These screens are in most of the devices we use. LCDs consist of a layer of millions of multicolored pixels. Each one of these pixels is controlled by a separate transistor. The pixels are switched on or off electronically using liquid crystals to rotate polarized light. While this sounds complex, the main thing to take away from this is that the technology gets sluggish when it gets too cold. Just like batteries, the colder it gets the slower the response is from the signal to pixel transition. This will lead to the image on your screen becoming blurry. The last component that is affected by extreme cold are the sensors within the devices we use. The sensors are designed to collect a wide variety of information from where we’re going to how many calories we burned in a day. Basically, sensors track the orientation of the device you are using and how fast it’s moving through space. This is crucial for navigation applications, telling time, and logging activity goals. Like the previous two components, sensors’ performance decline when temperatures fall. The main issue with degrades in a sensors’s performance is accuracy. If you were to take off a digital watch and wave it around in the cold, you could very well lose seconds if not minutes of your day. The reason for this is because the sensor, which is located on the backside of most digital watches, is calibrated to 98.6 degrees F.
Quite simply the easiest way to manage your device in the cold is to not use it. That being said, there are times when you have to use a smartphone in the cold. If that is the case try and store your device as close to your body as possible. Simply putting it in a backpack or purse does not suffice. Also, try and keep your time outside using the device to under 5 minutes. Carrying a smartphone in temperatures colder than -35 degrees F will kill it completely in five minutes. If your device does freeze, do not try and charge it will it is still cold. Make sure it is at room temperature before recharging it. Ignoring this advice can potentially do permanent damage to the battery.